In Austria it is tradition to exchange good lucky symbols called Glücksbringer at the stroke of midnight with the ones you celebrate. They are anything from chocolate and marzipan candies shaped like pigs, gold coins, chimney sweeps, four-leaf clovers, and horseshoes. I made these lucky piggies know as Glücksschweinchen out of fondant and embossed them with 2013. OK so I am a bit late with my Happy New Year greetings and bake but if you know me, I live by the saying ‘better late then never’. I hope you all had a lovely Christmas and fun New Year celebrations, no doubt you all indulged in delicious goodies as I know I sure did. I do apologise for the lack of posts as December is a crazy month for me work wise. For those of you who follow me on Facebook you would have seen the 200 or so mini cupcakes I baked for our annual Christmas business event and not to mention snowflake cookies. I always get the cookie baking bug at Christmas time, any other time I really can’t be bothered. 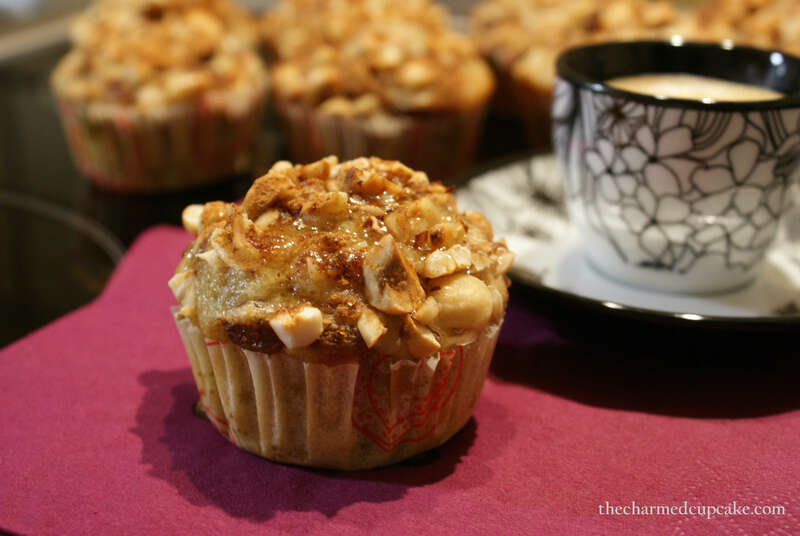 So to kick start 2013 I thought I would start with these delicious, somewhat healthy Hazelnut, Banana and Coconut Cupcakes glazed with honey. 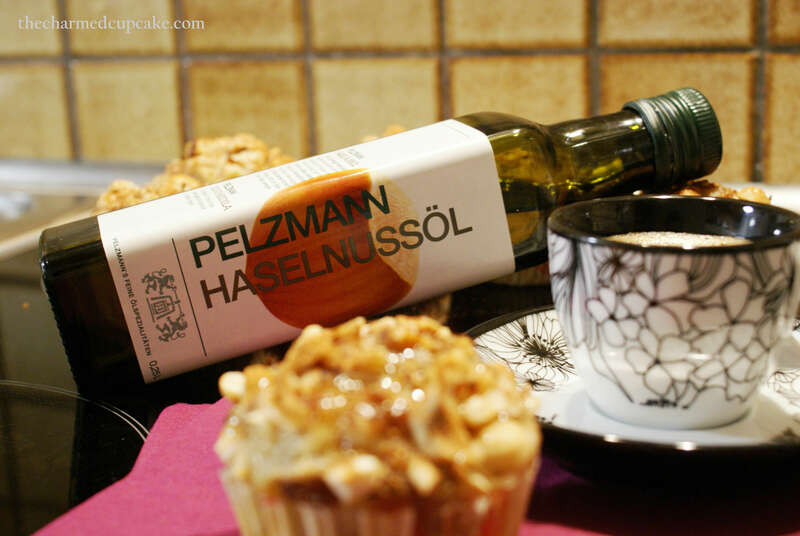 For those of you who recall my post back in October – Vegan Pumpkin Seed Oil Cupcakes, the well-known Austrian oil mill Pelzmann sent me more of their wonderful products to sample. Here I have sampled their premium hazelnut oil. Hazelnut cooking oil has a similar composition to extra virgin olive oil with high content in Omega 9 and Omega 6 fatty acid. This makes hazelnuts another healthy cooking oil option with flavourful taste. So without much further ado, let’s begin. Line cupcake pan with cupcake liners. In a large bowl, combine the flour, salt, baking powder, baking soda, and brown sugar. Stir to blend. In a blender or food processor, combine the bananas, eggs, oil, yoghurt, vanilla and blend until smooth. Add the banana mixture to the dry ingredients and beat until smooth. Stir in both the flaked and shredded coconut, grounded hazelnuts as well as the soaked raisins along with any liquid. 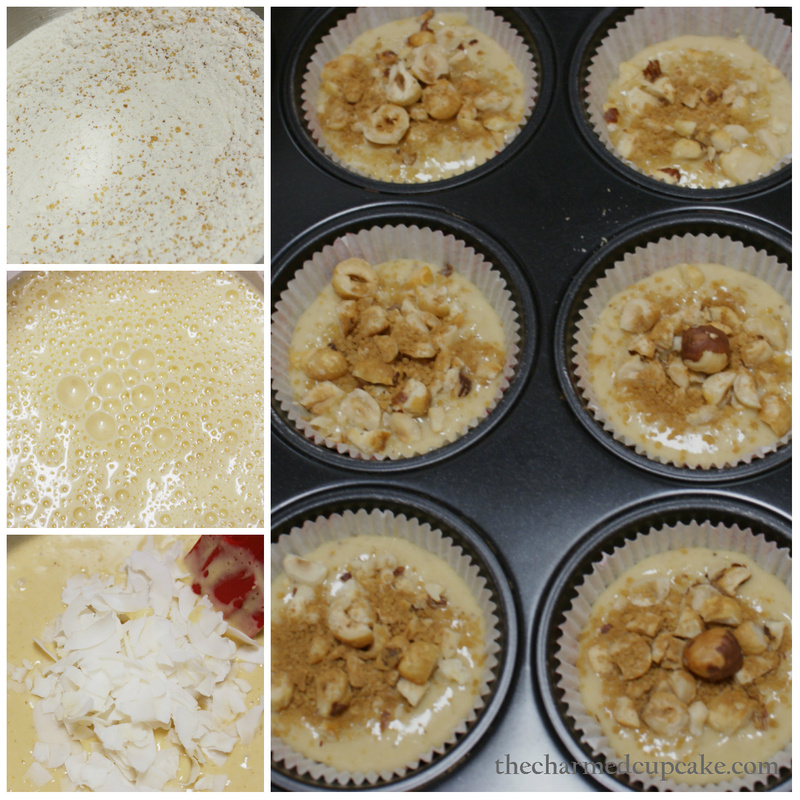 Spoon into cupcake pan till ¾ full then generously sprinkle with the nuts. Sprinkle the cinnamon sugar evenly over the batter. Bake for 20 minutes, or until cupcakes are golden brown and a cake tester inserted in the center comes out clean. Allow to cool in the pan for 5 minutes before transferring them to a wire rack to cool completely. Once cooled, drizzle with honey. 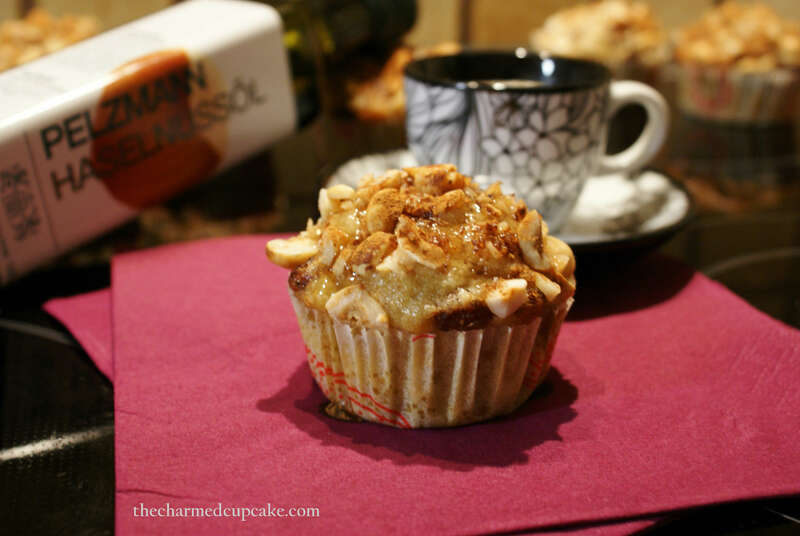 It’s debatable about whether or not one would call these a cupcake or a muffin but because the recipe is actually adapted from a few cake recipes I would say these are cupcakes – a healthier version. 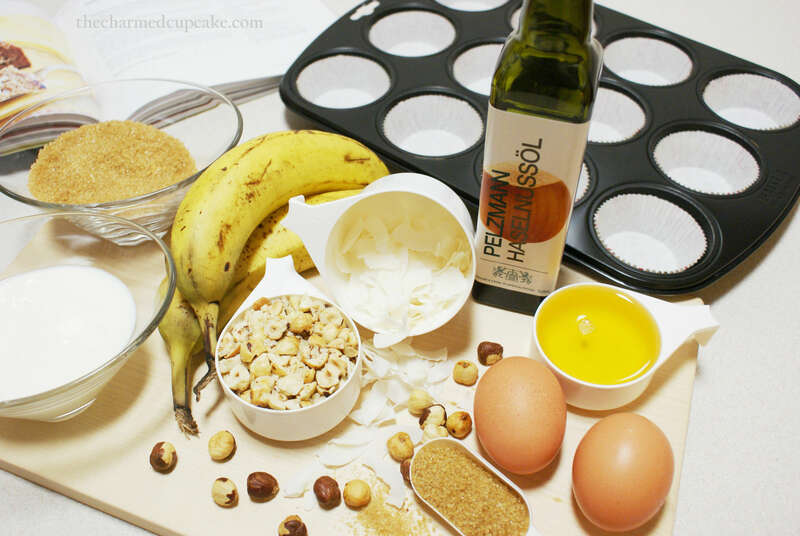 The toasted hazelnuts combined with the cinnamon sugar and honey glaze give the banana, coconut and rum infused cupcakes a lovely sweet nutty crunch. The cupcakes are dense yet light whilst still deliciously moist. The cupcakes themselves are not very sweet so the honey glaze compliments it very well. The hazelnut oil is not strong so you will not get an over powering flavour of hazelnut like you do with pumpkin seed oil. 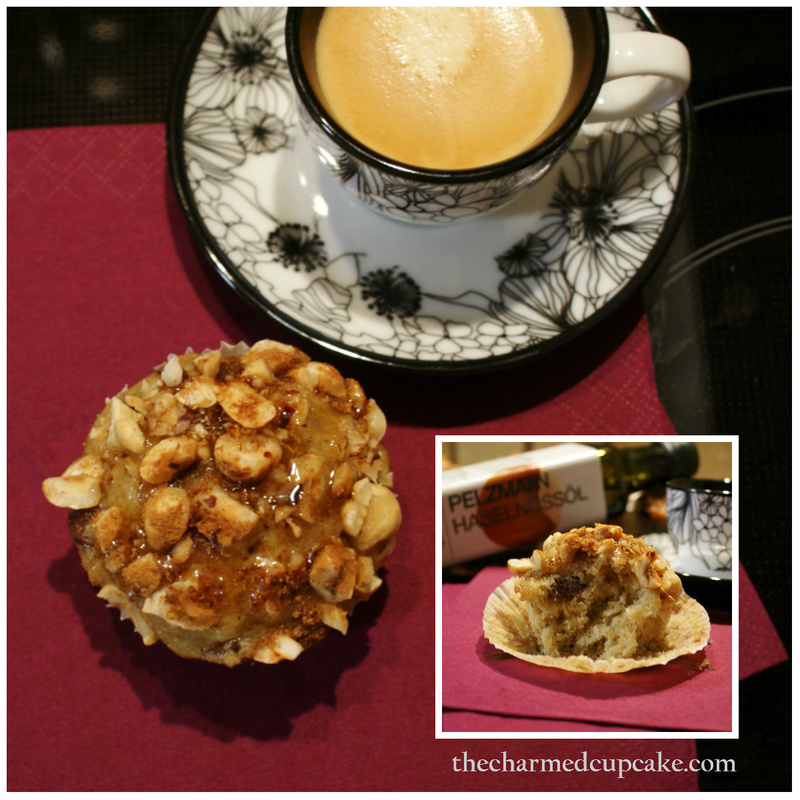 These cupcakes are a scrumptious and healthier start to the New Year. These are a definite must bake! No need to feel guilty munching on these yummy cupcakes as they are packed with fruit, nuts and the hazelnut oil gives you the good Omega 9 and Omega 6 fatty acids. I hope enjoy them as much as I do and I would love to hear how you went with this bake. 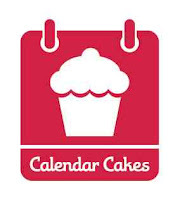 I am entering this into the healthy and healthier January Calendar Cakes challenge hosted each month by Dolly Bakes and Laura Love Cakes. Again, thanks for sharing this awesome talents! Thank so much for the lovely comment Leimun. 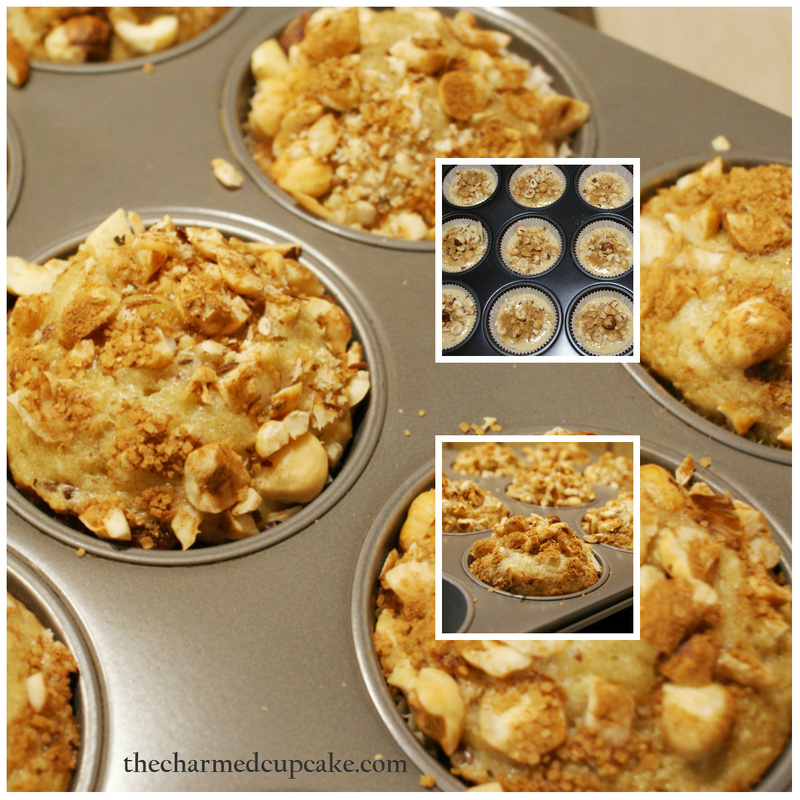 Definitely give these a try as they are very easy to bake and delicious. Thank you so much for pointing this out to me. I seem to have forgotten it off the ingredients list. I will update that now. Stir in 1/2 cup grounded hazelnuts. Your cupcakes looks delicious! I prefer banana in bakes rather than eating them as they are! Haha! And baking them with the combination of coconut and rum, certainly is my cup of tea! Yup, no frosting for me too, I prefer simple yummilicious cakes like this that are not crowded with overloaded of sugar from the frosting! Wish you a lovely delicious weekend! I am still wowed by their pumpkin oil, so I am sure their hazelnut oil would be just as amazing. 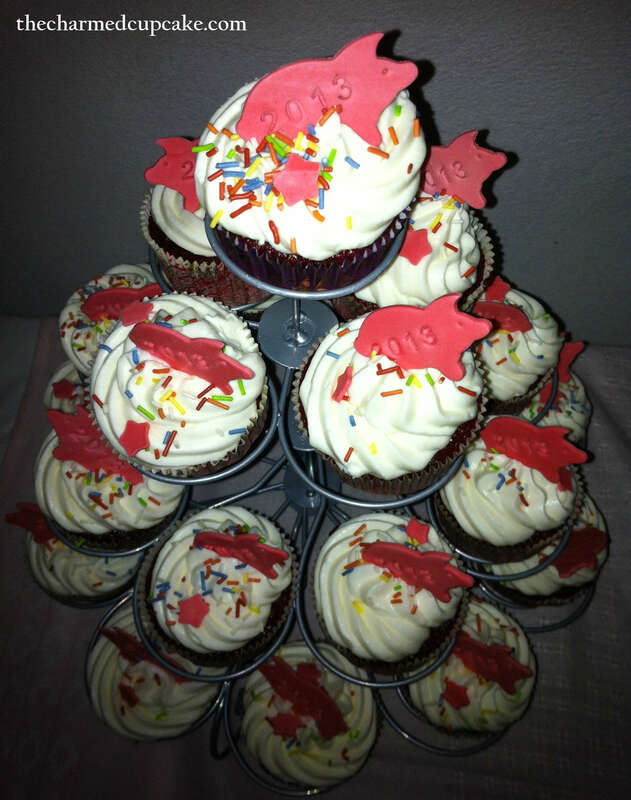 these cupcakes look and sound like perfection, what a great way to kick off the new year!!!! Love your ingredients in these! And I bet the texture worked out really well, too. Thank you for the lovely comment. The texture turned out really well. I really love the first sweet crunch of the nuts followed by the mix of shredded and flaked coconuts and moist raisins. 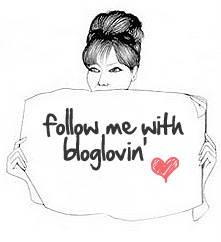 Enter your email address to follow my charmed bakes and receive notifications of new posts by email.